When the University of Nevada, Reno built its new 295,000-square-foot Mathewson-IGT Knowledge Center (MIKC), it wasn't just to replace an old library that was bursting at the seams with books. Rather, it was a conscious effort to make a break from the past and build a multi-purpose, multi-media facility incorporating technology from the ground up. "In comparison to many other institutions, we were not really in such dire straits," said Steven Zink, vice president of information technology and dean of university libraries. "This was a conscious decision based on our integrated information resources/technology organization to make a break from the past." To do that, he said, UNR needed a transformative, physical statement, as well as substantive infrastructure change in what constituted a traditional library. "You definitely start from scratch if you are assuming that the 21st century is going to be quite different than other centuries," he said. "The Knowledge Center is really the beginning manifestation to substantial curricular change on campus, and a likely sea change in learning, I believe, in general." One change is calling it a Knowledge Center instead of a library. "We started receiving a lot of attention as soon as we began talking about a 'Knowledge Center'," he said, "which was considered some sort of hype or blasphemy in library circles." The MIKC, however, is destined to be used in ways that are different from the paradigm of a traditional library. For example, the MIKC has the capacity to hold 3 million volumes. (MIKC's predecessor was a 177,000-square-foot facility holding more than a million volumes.) Zink, however, said he believes that will be an unlikely use. "We will never use the space for that as printed materials will not be published in sufficient quantity over the upcoming years to ever fill it," he said. "We are contemplating other uses, even such things as storing classified rock samples for geology, etc. for safe keeping and ready retrieval. 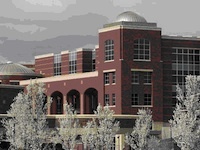 One unique feature of the MIKC is that it was built with an all-fiber high definition distribution system, used by all the audiovisual systems in the building (and used throughout the campus). One MIKC space taking advantage of the system is the Wells Fargo Auditorium, a 163-seat room that features a stage, surround sound, video capturing and streaming, and three screens for high definition projection. The auditorium, which is used by the school and the community, hosts literary readings, academic lectures, awards ceremonies, outreach programs, film festivals, and virtual interactive conferences to campuses around the world." Other rooms using high definition signal distribution include a digital studio classroom, equipped with table microphones that auto-steer Sony HD cameras, and a dynamic media lab where film students can develop multimedia projects. The DataWorks labs and services have high-end hardware and software for data visualization, geospatial maps, and more. The MIKC also has two videoconferencing rooms, one accommodating 10 seats and the other accommodating six. The library contains more than 1 million volumes of journals and books (or, as Zink jokingly referred to them, "legacy information objects"). There are also more than 15,000 electronic journals and a growing collection of electronic books. To handle print volumes, the university uses an automated retrieval center, called Mathewson Automated Retrieval System (MARS). MARS, a robotic system, houses the books and journals that are accessed less frequently, saving space for studying and for placing heavily-used materials. Some of these materials were previously stored in an off-site facility. Zink said MARS accommodates four times the volume of traditional shelving and retrieves materials in less than 15 minutes. MARS has six cranes, more than 30,000 bins, is three stories high, and contains more than 600,000 items. MARS handles books published before 1995 that have been checked out seven or fewer times, journals older than one year, most special collections, and most government documents. Those interested in material stored in MARS submit a request by pressing a button in the Web-based library catalog. This prompts the system to determine which of the bins it needs to retrieve. A crane automatically gathers that bin and delivers it to an employee, who then selects the specific item out of that bin. The employee delivers it to the circulation desk, where it is held for the user. The process is guaranteed to deliver items in 15 minutes, but most arrive in closer to five minutes. When books are returned, an employee scans the book using a bar code reader. The MARS system then knows which bin to retrieve, and the crane automatically goes to that bin, retrieves it, and sends it to the employee. The employee places the book in the bin and hits a key on the keyboard, at which point the bin is automatically sent back to its proper location. The MARS system is not only practical, it's rather smart, explained Zink. "It is important to keep in mind that the materials are housed randomly by size," he said. "When an item is used and returned it may not go back to the same location from which it came; it goes to the closest available spot, based on size." The MIKC, said Zink, is only the beginning, and part of a much larger plan. As part of a new campus academic master plan, Zink became chair of a task force of deans and other interested parties that will help prepare the university for the future of education." "[The job of the task force is] to analyze the current university curriculum and make suggestions as to how we can assist our students to become as prepared as possible," he said, "for a fundamentally different global knowledge economy of the 21st century.